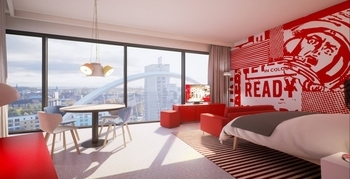 Radisson RED has opened its first UK hotel in Glasgow. This new brand is located in Glasgow’s West End close to music venues, The Hydro and the city centre. This is only the second Radisson RED in Europe and the fifth in the world. Radisson RED is Radisson’s newish brand marketed at millennials with a focus on technology and music. The Glasgow hotel scene is generally not well regarded so this could be an interesting option. As the token millennial in the HFP office, I have been invited to Glasgow next month to take a look at the Radisson RED brand and what it has to offer. Keep an eye out for my review. Stays earn points in the Radisson Rewards scheme, and if you have an American Express Platinum charge card you receive automatic Gold status in the programme. You can also top up any points you earn from your stay with a transfer from American Express Membership Rewards at the generous rate of 1:3. 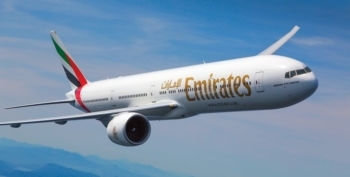 Emirates has announced a new route between Edinburgh and Dubai. This will replace the Etihad service to Abu Dhabi which is being withdrawn at the end of September. From 1st October there will be a daily overnight departure at 8.15 pm which lands in Dubai at 6.40 am. It returns from Dubai at 9.55 am landing at 2.50 pm. Timings appear to move about, however. In November, it is showing a 6.30 pm departure from Edinburgh, landing at 5.55 am. The return leaves at 10 am, landing at 2.15 pm. The Boeing 777-300ER will have eight First Class suites, 42 Business seats and 304 Economy seats. You may have noticed some ads across the site this week from Allen & Jain. This is an educational consultancy run by a Head for Points reader based in London. The company specialises in helping parents get their children into Oxbridge or Ivy League colleges by helping with the entire preparation, application and interview process. HFP readers can have a free, no-obligation consultation. Is Marriott backtracking on 5-months of Platinum status for Amex Platinum cardholders? Loganair launches Clan Loganair - is it worth a look? I was looking on the RR site a couple of weeks ago for a friend and it lists the hotels there. They allow dogs for those that impacts on. They have historically received a subsidy along with their teaching grant to help cover the extra costs of their collegiate structure and associated student perks. This subsidy has been reduced over the years by central government as it was seen to be unfair to other universities and their students. The subsidy may already have been eliminated entirely or replaced by some other funding to some degree, I have no idea, I left the sector a decade ago. I should also stress that tbe collegiate structure was never entirely supported by central government, the colleges themselves partly funded the perks through other sources of income. This is all independent of research funding except that an element of overheads from that too may have supported college perks. Loads of v good stays at Glasgow Hilton, upgraded to exec lounge loads of times, v happy with friendly genuine service from local staff. Is that the same Exec Lounge in the basement with no windows? Might actually be ground floor but it still has no windows. It’s pretty basic and uninviting…surely you’d have to agree? The (IMO ghastly) full wall mural would put me off staying at the Radisson RED despite the probably fantastic views. Reminds me of the Park Plaza Riverside that has rooms with the creepy full wall image of a shining-esque girl/doll/whatever it’s supposed to be. Yeah the mural puts me off and also reminds me of Marriotts Moxy brand where there is something random like that on the walls. I’m not too keen on Moxy either although I dare say if it had been around fifteen to twenty years ago I would have loved it. In terms of value for money I think Moxy Excel is outstanding. I will do a review at some point. I also went to a dinner at the Vienna one last year and I was probably the youngest of the group at 46. It would be a bit odd if your employer insisted you stay there if you were over, say, 35 but on my experiences so far I am pleasantly impressed. That was similar to my experience in Aberdeen last year. Stayed there to pick up the free night cert for mega bonus. I’m 38 and although I wasn’t the oldest there I wasn’t far off it. Nothing against them, if I needed to I would stay again. The bed was comfy and I slept well but it reminded me of a student union with rooms above. Great concept but sadly about fifteen years too late for me. I really liked the Moxy. Friendly staff. Trendy open plan multi purpose ground floor. Excellent cheap coffee (they charged me £2 for a double Nespresso). The rooms are like a luxury version of Holiday Inn Express. Super King bed, very comfortable. Heavy luxurious bath towels. Quirky decor. Free WiFi. Good Internet speed and they encourage you to cast your own entertainment to the 40″ TV. I loved it and would definitely stay again. And I’m 60, traditional, and normally unimpressed by modern gimmicky stuff. Emirates obviously have faith in the scottish market. When i heard about this i assumed that they would pull one of the flights from glasgow and both airports would share the two flights. It will be interesting to see what unfolds. Does anyone have geographic data on how many people from the east of scotland used the glasgow service..does any exsist? I wonder if Glasgow flights will suffer? Will fares be higher at Edi than at Gla? GLA resident here. I have driven to EDI for the QR flight a few times, it’s only really an hour (I live in the west end) from my house. The QR flight is being upgraded to a A350 (Think it already has been?). I wouldn’t be surprised if QR started a 788 to GLA and had a price war with EK (If they can afford it). I do remember back pre-2014/5/6 EK owned the entire Scottish ME3 market because QR and EY wasn’t in the market. People from all over the centre belt would use GLA was the DXB flights. With EY out of the game, I think we’ll have GLA with 1 or 2 dailys to DXB and 1 to DOH within a year. The EDI flight DXB flight is just gonna sap up all the people that used EY and maybe some QR pax.